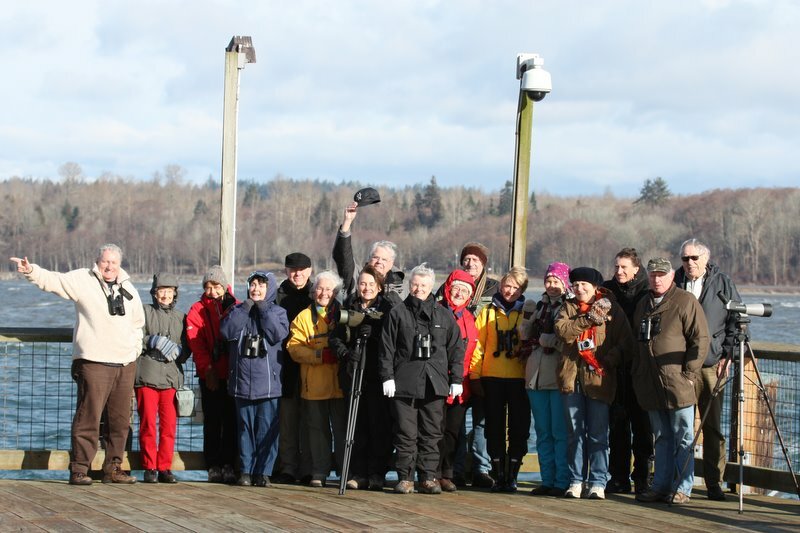 Seventeen birders joined me on a brisk sunny Monday morning across the Border to Blaine, Washington. They like their names in lights: our Guru Anne M, Accident-prone Annie K, Always-lost Bill & Mary and their beanied friend (sorry I forget your name), Roger never-trust-his-directions M, Roger’s affable sidekick Mike, Go-All-Day Lorna, the impeccable but often inane Hans, Chef Marian, our Loquacious (not) Secretary Eleanor, Trip Expert and photog Terry, our rookie Pro Photog Ursula and 4 WRSN guests Super Dave, Shy Marg, Scope-bearer Leona and Tree Guru Al. Hi-lites for me were: 3 Grebe species and a Long-tailed Duck up-close-and-personal, drive to and walk in a new venue Birch Bay State Park, and finally seeing a couple of Pacific Wrens. Crossing the Border around 9:00 a.m. for our 5 car convoy was smooth, except we were short three participants who one of us could not find waiting somewhere in White Rock. They eventually found us at our first stop at the dead-end public wharf and marina at Drayton Harbour. In the harbour were several Horned Grebes, a couple of Eared Grebes and a couple of Red-necked Grebes (one caught a snake-like fish that I forget the name); neat to see them so close and identify the differences. 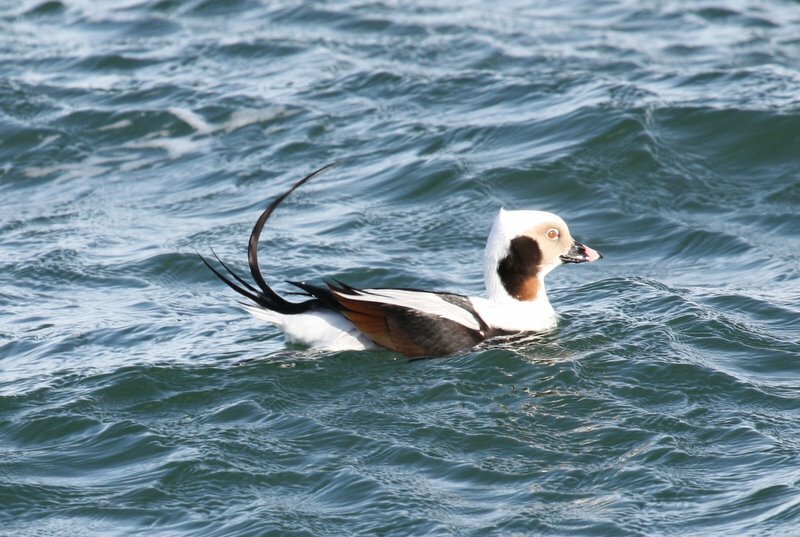 Also saw Bufflehead, Common Goldeneye (and one Barrow’s), Red-breasted Mergansers, Pelagic and Double-crested Cormorants (many nests on the breakwall). A couple of Black Oystercatchers were also resting on the rocks of the breakwall. On the Georgia Strait side, looking at White Rock, it was very windy and wavy, so we left and circled the harbour to the other end of the Bay at Semiahmoo Resort. On the boardwalk lookout, a Long-tailed Duck (formerly Old Squaw) posed nicely for us. Lots of Common Loons and a couple of Pacific Loons seen. The sun was shining so we took the obligatory Group Photo. Check out photos of this outing (and others) at our Picasa site: http://picasaweb.google.com/dncbirding. We enjoyed our Smoko around 11:30 a.m. at a nearby and very comfortable, wind-protected snack shop. Marian’s cake was delicious and some of the conversation was almost stimulating. We walked along the inland harbour path; lots of Greater Scaup and a couple of Ruddy Ducks caught our attention. Also saw a Harbour Seal, but Ursula got peeved when someone scared away the Bald Eagle that was posing nicely in a tree above us. A few so-called hearty Birders complained about the cold, so we left this Semiahmoo County Park and drove across to and around Birch Bay to enjoy a sheltered walk in Birch Bay State Park. White Rock Al led us on the walk through this Park and I was amazed at how knowledgeable he was about the many different tree species there. Then I realized that he had simply memorized the signs. It was a very enjoyable walk at a new venue (for me), despite no birds. We did rustle up a couple of Pacific (formerly Winter) Wrens which we often hear but rarely see. Someone heard Marsh Wrens too. We left for home around 2:00 p.m., having enjoyed some good sightings, beautiful scenery and habitats, and for some even a bit of interesting conversation and perhaps meeting some new friends. Sandra and I are leaving tomorrow (Feb. 9) to spend three weeks in Ontario (Dorset, Brampton, Niagara Falls and Ottawa) visiting with (i.e. spongeing off) friends and relatives. The DNCB group will continue to meet on Monday mornings at Petra’s around 8:00 a.m. for departure at 8:30 a.m. on outings “around the Bay”. Roger Meyer will lead next Monday’s outing. I will next be at Petra’s for an outing on Monday, March 7. Check out our Blog at www.dncb.wordpress.com and, again, comments welcome and let me know if you’ve had enough of this diarrhea.